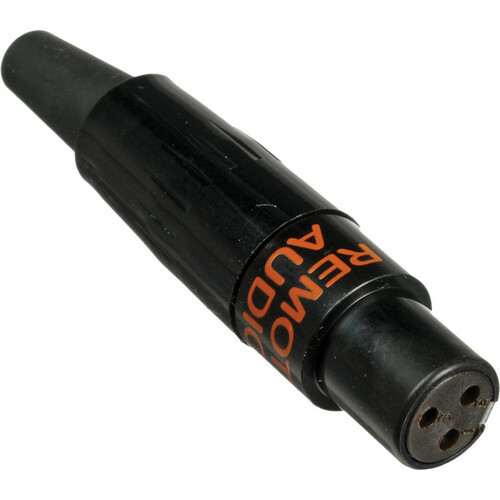 The TA3F-B from Remote Audio is a slim and durable 3-pin female mini-XLR connector with gold contacts for maintaining a high-quality signal path. The connector has a black finish to match most commonly used cables. The crimp strain relief helps minimize internal solder joint failures and the connector design supports wire diameters up to 4.8mm. TA3F-B 3-Pin Female Mini-XLR Connector (Straight Connector, Black) is rated 4.7 out of 5 by 3. Rated 5 out of 5 by Noivad from Works as advertised I got this to create an adapter for my AKG K191-DJ headphone, so I could plug them into the Kanex AirBlue I also got from B&H. Thus plug is constructed to pro-level quality, not prosumer where they gouge you, but true pro-quality. ( I know because I have done professional AV production.) Making the cable was easy enough: I could have done it but I have a friend more versed in cable construction. So we got AKG's service manual and gutted an old sony cloth wrapped 3.5mm headphone cable for the other end, cut the cable down to a few inches and made it in no time. (3 solder joints, although very tiny, do not take long.) I am planning to buy another one for a Female version to try out other Bluetooth adapters that have a male 3.5mm plug, since we still have the female end of the 3.5mm sony cable. So, yes I would buy it again and recommend to a friend: top notch product! Rated 4 out of 5 by Midnight Taco from Easy soldering This connector is solid and was easy to assemble. I recommend!